Robin Burks | Children of Time: The Companions of Doctor Who Available Now! Cape Comic Con Wrap-Up And What’s Next Madame Vampire Has Arrived! Children of Time: The Companions of Doctor Who Available Now! 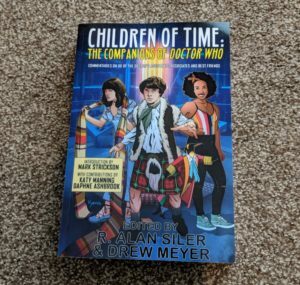 I’ve had a lot of people asking me about this book, so here’s the official announcement: Children of Time: The Companions of Doctor Who is available on Amazon now. The Doctor’s Companions. They’ve been through Dalek Invasions, Android Invasions, Zygon Invasions and Christmas Invasions. They ask questions, get in trouble, get out of trouble, and challenge the Doctor to think and act in new (usually better) ways. Children of Time: The Companions of Doctor Who features profiles of companions from all formats of Doctor Who: television, novels, comics and audio dramas. Our contributors include well-known authors, four librarians, two ukelelists, a playwright, podcasters, publishers, students, and the writers and artists behind some of the Doctor’s companions. Why am I posting this you ask? Well, the answer is two-fold. First, I contributed an essay to the book on Donna Noble and why she’s the most important woman in the universe. The best reason to get this book, though, is that all proceeds go to Furkids, which is Atlanta’s largest no-kill animal shelter and rescue. That’s right: if you buy this book, you get to not only read about the Doctor’s companions, but you also get to help animals. That’s a no-brainer, right? The book also features some gorgeous artwork by a variety of artists. If you do purchase the book and bring it to me at any of the events I show up at, I will gladly sign it for free. You can purchase your copies of Children of Time: The Companions of Doctor Who right here.